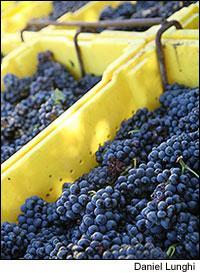 Pinot Noir grapes for Mumm Napa's sparkling wine were among the first to be picked this year. As harvest 2006 kicks off in California, the jury is out on just about everything but the anxiety level. Although vintners around the state express cautious optimism about the potential quality, grape maturity lags in some vineyards as a result of a topsy-turvy growing season. Prospects in general look good for early-ripening varieties such as Sauvignon Blanc, Chardonnay, Pinot Noir and Zinfandel. But late-season grapes, particularly Cabernet Sauvignon planted in cooler sites, will require outstanding fall weather to achieve ideal ripeness. A late harvest looked inevitable throughout the state following an unusually cold, wet spring. In many regions, March was the rainiest on record, which inhibited vine development. "It delayed budbreak about one month. We started off really far behind," said Justin Smith, owner of Saxum Vineyard in Paso Robles, which focuses on Syrah, Mourvèdre and Grenache. Growing conditions were fairly good in May and much of June. Then at the end of June, a brutal heat spell began across the state; it lasted about three weeks, with temperatures in some vineyards topping 115 degrees F. Vintners feared crisped leaves and burnt grapes. But the biggest surprise of the season to date, some producers say, is that many vineyards apparently came though relatively unscathed. "I thought everything was going to be cooked, but I'm amazed at how little damage there is," said Kristin Belair, winemaker at Honig Vineyard in Napa Valley. The spring rain may have actually helped save the vintage. Since grapes require warm, sunny weather to grow and develop, the early rains--that got the growing season off to a late start--left the grapes green, underdeveloped and thick-skinned at the time the heat wave hit. Grapes at that stage of development are less susceptible to heat damage. Also mitigating the heat were the relatively high humidity levels and the vines' unusually dense leaf canopies (also attributable to the wet spring), which shaded many grapes from the unforgiving sunlight. Most California vintners interviewed for this report say that yields look to be in line with normal expectations. That is surprising given the weather scares, as well as the enormous, record-setting 2005 crop (vines tend to produce smaller crops in the years following large ones). Sparkling-wine producers in the North Coast brought in their first lots at the end of August, about two weeks later than normal, with Mumm Napa the first to pick, on August 23. But harvest didn't really pick up for them until the beginning of this month. "This is the slowest start I've ever seen," said Eileen Crane, president and winemaker at Domaine Carneros. In the Santa Rita Hills appellation of Santa Barbara County, where Pinot Noir dominates production, vintners also anticipate beginning harvest about two weeks late. For Pinot Noir and Chardonnay in Sonoma, Carneros and Napa, Patz & Hall winemaker James Hall expects harvest to kick into high gear around Sept. 18, about three weeks later than usual. Most Napa Valley Cabernet looks to be at least a month from ripeness, said Craig Williams, winemaker for Joseph Phelps in St. Helena. In the meantime, North Coast producers are hoping for dry conditions. Thin-skinned grapes such as Chardonnay and Pinot Noir are particularly susceptible to rot this year. The grape bunches have an unusually large number of berries because this year's flowering occurred in ideal conditions (after the spring rains stopped). Within these tight bunches, berries are now bursting, which leads to rot. That's been exacerbated by the weather: August and September have been quite mild, with foggy mornings that have increased moisture in the vineyards. While conscientious growers can address current conditions, rain could badly worsen the situation. "If the weather stays the same, we're OK. If it rains, there could be botrytis problems," said Hall. Still, in both Napa and Sonoma, some vintners express tremendous optimism about the prospects for Cabernet Sauvignon, the state's hallmark variety. "In terms of high-end Cabernets, it looks like this could be a phenomenal year," said Paul Hobbs, owner and winemaker of Paul Hobbs Winery, which makes Cabernet from the Oakville, Carneros, Howell Mountain and Napa Valley appellations. Other producers are more cautious. "I'm just hoping we get a [warm] fall like last year, when we picked Cabernet in mid to late October and early November, and it turned out really well," said Karen Culler, winemaker at Ladera, Wolf Family and her own label, Culler Wines. "We really need a decent period of warm weather."